The Globetrotters’ one-of-a-kind games will showcase “Amazing Feats of Basketball” on the court, as the team battles their longtime foe the Washington Generals. With incredible ball handling wizardry, rim-rattling dunks, trick shots, hilarious comedy and unequaled fan interaction, this must-see event is guaranteed to entertain the whole family. After the game, the Globetrotters will sign autographs and take photos with fans. 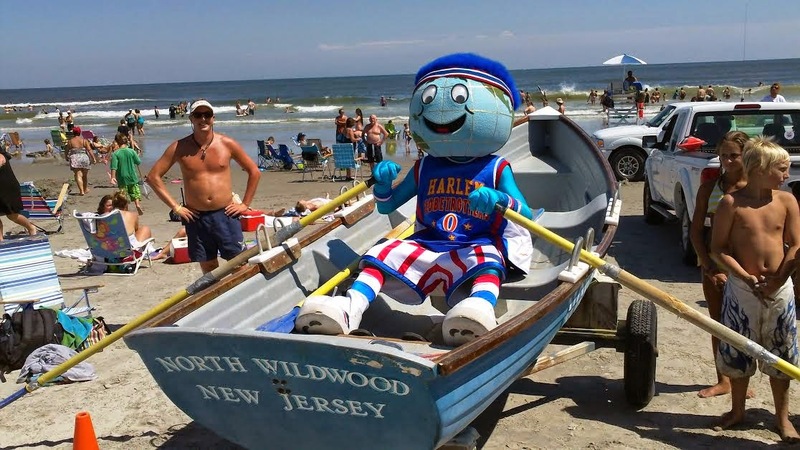 Globetrotters star Bull Bullard demonstrated his skills off the court in Wildwood by performing trick basket shots from the Sky Coaster at Morey’s Piers in 2016 (YouTube) and a 210-foot shot from a helicopter flying avove into to a hoop on the Wildwoods’ beach (YouTube). Both unprecedented feats put the Wildwoods in the national spotlight with the videos going viral and garnering media attention around the world. Bull will soon look to outdo himself in 2018 with planned trick shots on and off the court. The Globetrotters are also offering two-hour Basketball Skills Clinics on the Wildwoods Convention Center court on each game day – August 15 through 18 – from 10 AM. to 12 PM. Globetrotter stars lead each clinic, which is designed for fans ages 6-12. A spot in the clinic costs $39, or choose to upgrade to the $49 package that includes a voucher for one complementary ticket to any one of the four games in Wildwood. No basketball experience is required. Space is limited. Tickets for all games and clinics are available now through www.ticketmaster.com, the Wildwoods Convention Center Box Office, or by calling 800-745-3000 or visiting www.HarlemGlobetrotters.com. The Harlem Globetrotters® are legendary worldwide and synonymous with one-of-a-kind family entertainment and great basketball skills for the past 92 years. Throughout their history, the original Harlem Globetrotters have showcased their iconic talents in 123 countries and territories on six continents, often breaking down cultural and societal barriers while providing fans with their first-ever basketball experience. Proud inductees of the Naismith Memorial Basketball Hall of Fame, the Globetrotters have entertained hundreds of millions of fans – among them popes, kings, queens, and presidents – over nine thrilling decades. The American Red Cross is the official charity of the Harlem Globetrotters. Sponsored by Entenmann’s ® Donuts, Ticket Galaxy, Tum-e Yummies and Baden Sports, Harlem Globetrotters International, Inc. is a wholly-owned subsidiary of Herschend Enterprises, the largest family-owned themed entertainment company in the U.S.